I’m always on the hunt for delicious, nutritious recipes. When I realized how difficult the majority of healthy recipes online were, I began a desperate search for the easiest and tastiest one. After hours of searching, I finally found a winner. This Slow Cooker Lentil Soup recipe has a high nutritional value, is full of flavor and surprisingly simple! This recipe is guaranteed to make you appreciate your slow cooker even more. The ultimate comfort food experience is coming home to the hypnotic aroma of a meal that’s already been cooked. Thankfully, our beloved slow cookers allow us to create satisfying meals in a stress-free way. Slow Cooker Lentil Soup will satisfy the pickiest of eaters — and that’s particularly impressive. It’s a hassle-free way to create a healthy meal, and the leftovers taste amazing for days and days! Slow Cooker Lentil Soup is a staple recipe every home cook SERIOUSLY needs in their life. 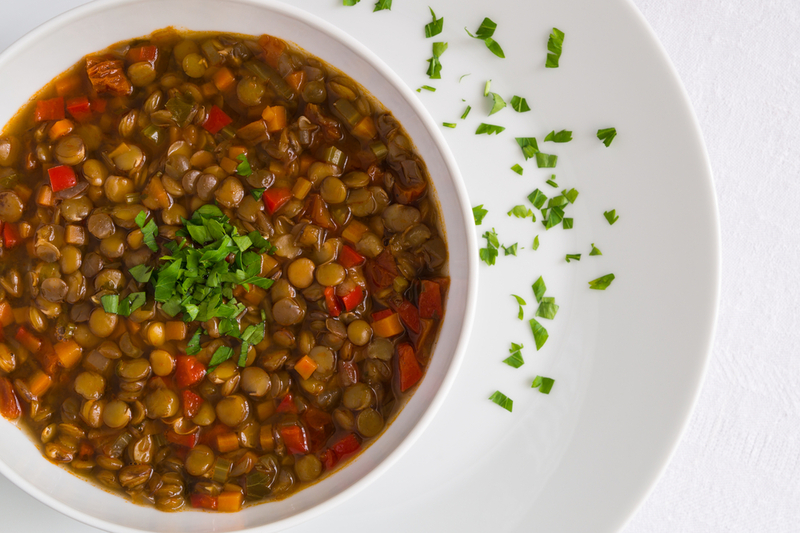 Lentils are known as the “powerhouse of nutrition,” and it’s easy to see why. They are a good source of potassium, calcium, zinc, niacin and vitamin K, but are especially rich in dietary fiber, lean protein, folate, and iron. According to The Centers for Disease Control and Prevention, eating plenty of nutrient-dense foods like lentils can lessen your risk of many serious medical problems. This tiny nutritional giant fills you up — not out! Place chopped carrots, celery, onion, garlic, and shallot into the crockpot along with lentils, vegetable stock, canned tomatoes, bay leaf and dried thyme. Cover with lid and set cooking time (4 Hours on HIGH OR 8 Hours on LOW). Next, prep your swiss chard into bite-size pieces (I usually cut it both lengthwise and crosswise to achieve this), put in a bowl or Ziploc bag and place in refrigerator for later. When cooking time is up, add swiss chard, red wine vinegar, Kosher salt, black pepper, and ground cumin. Place lid back on and let sit covered for fifteen additional minutes before serving. This freezes great and makes 8 huge (1.5 cup) servings. Excellent served with a crusty bread and side salad. Enjoy! Tip: use a food processor to do the chopping. SHARE THIS ARTICLE TO HELP YOUR FELLOW HOME COOKS!